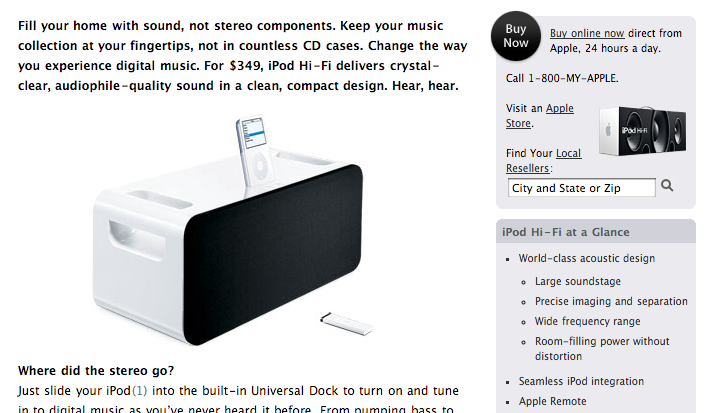 Now Apple sells a $349 boom-box to play your 128kpbs iTunes tracks. (Corollary: whenever they finally release a widescreen iPod, they’ll stil sell videos in 320x240 pixels.) For the price, you’d think it would include AirTunes reception (the Nintendo DS has wi-fi and touch-screens at $150). And not be ugly. Besides, the design itself is hardly functional: sure, it works on batteries, but you can’t really use it on-the-go because of the way your iPod is exposed (to theft or accident). Oh, and apparently it’s too heavy for carrying anyway. I love that Apple would release a so-called “audiophile-quality” speaker system when they sell 128kbps songs and they’re consistently criticized for the quality of the iPod’s included headphones, or lack thereof. Of course, strategy-wise, the iPod Hi-Fi (and the leather sleeve, along with last keynote’s FM adapter) is a dubious move: much of the iPod’s appeal is based on the huge accessories market, which Apple shouldn’t want to scare away — but that never prevented them from stealing independent software developers’ thunder one after another, either, so there’s nothing surprising here. I know an audophile, far away in a foreign country, and I’d be curious to know what he thinks of this thing. And don’t you think the packaging is cuter than the object itself? You’d want to play it inside the box, if the iPod didn’t have to stick out. And the Mac mini is has an update, pretty unimpressive — unlike its price boost. I don’t know how expensive the G4 mini could get, but you can now reach $1,320 with a reasonably maxed-out setup (2GB RAM, 120GB hard drive and a wireless keyboard and mouse, nothing out of the ordinary). I’m sure Steve has been all this time thinking that thing was too cheap and it was unacceptable and demeaning, and he seized the opportunity to fix that. So the Core Duo mini can now theoritically smoke my iMac (for $400 more than I bought my own refurbished mini) but it can’t, actually, in a default configuration, because it’s still a 512 MB setup (for the price!) and its on-board Intel video controller now gobbles up a good share of it. Even though the new design now uses two RAM slots instead of one (how did they manage to free up room inside? is it going to be even more awkward to open up than it was, or did they manage to fix that? ), which means starting off at 1GB should be that much more affordable than it was before. The most interesting announcement of the day, and that’s for lack of competition, must have been Front Row with Bonjour (i.e., accessing another computer’s iTunes and iPhoto libraries from the TV-connected mini, finally Front Row’s quite limited potential as a home entertainment system). But we old-timers are still not allowed in. Leander Kahney seems to be thrilled by the Nintendo DS-inspired MacTablet mockups submitted by Engadget readers — regretting that “ using two screens would drive up the cost of a consumer-level laptop beyond a point where Apple would feel comfortable releasing it ”. Yeah, sure, that would stop Jobs. That, as opposed to just the fact that you can’t spend your time typing at a touch-screen’s virtual keyboard if you want it to last more than a month. Or the fact that having only one touch-enabled display out of two means… you can’t move the mouse cursor on the upper screen. Steve’s Outfit. Heh. Thanks, but no thanks.